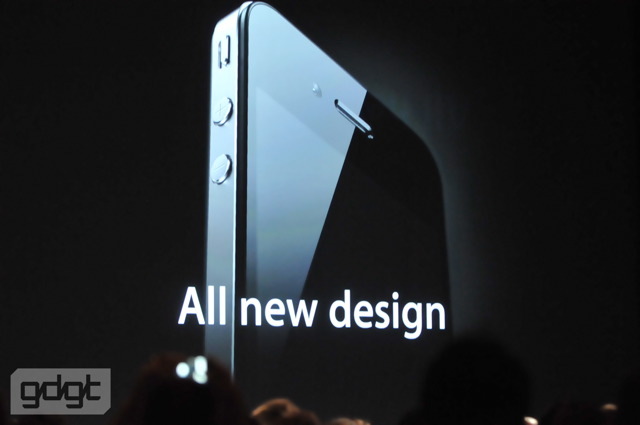 The Apple WWDC had the launch of the new generation of iPhone as its latest hot news. Its the iPhone 4G also called as iPhone 4, and as expected its coming in with some amazing features. Its 9.3mm thick, that is 24% thinner than the iPhone 3GS. Its made of stainless steel and glass, and with integrated antenna system on the right inner side. 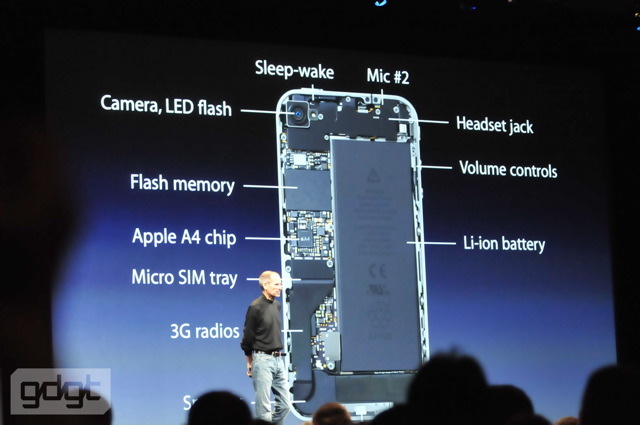 The iPhone 4 has a front camera, and 2 mics, one of which helps in noise cancellation. As Steve Jobs claim, its the slimmest smartphone ever. Apple names the new display in the iPhone 4 as Retina Display, which has a pixel density and clarity far better than any other Apple smartphone. Apple has come with a far more beautiful screen, with the pixels having 4 sections in each of them, making 326 pixels in every inch and everything more clearer than ever. Comparing the images of iPhone 3GS and iPhone 4, it clearly shows how the image blurs out when you zoom out a picture in iPhone 3GS. 3.5″ display, 960×640 pixels with 326 pixels per inch. The Apple iPhone 4 is powered with the A4 chip, and allows usage of MicroSIM. The battery is made bigger and so, the battery life gets longer. 7 hours 3G talk, 6 hours 3G browsing, 10 hours WiFi browsing, 10 hours video, 40 hours of music, and 300 hours of standby. Arsenic, BFR, mercury, and PVC free – Environmental friendly again. Upto 32 GB of storage available, so it would be as usual 8GB, 16GB and 32GB versions. Quad-Band HSDPA/HSUPA – 7.2 Mbps download and 5.8 Mbps upload. Apple adds in a 3-axis gyroscope, which along with the accelerometer would help in providing 6-axis motion sensing. That would be helpful for gaming. As rumors said, Apple has finally gone from 3-megapixel to the 5-megapixel camera with a backside illuminated sensor. It has 5x digital zoom, and Tap to focus. There is a LED flash with the camera, so finally the need for flash is fulfilled. HD Video Recording. 720p at 30 fps. Tap to focus video recording, and options to edit the HD videos right on the phone itself. Apple launched the iMovie app for iPhone, which allows editing the videos with adding of titles and much more, like showing the edited videos, and bringing in the music from iTunes. Geolocation information can also be brought into the iMovie app, while editing the videos. Front camera helps in video calling – FaceTime. Switching the front and rear cameras automatically possible. The all new iOS4, the most advanced mobile OS in the world. Over 1500 developer APIs and over 100 features. MULTITASKING – The most awaited, the much needed and the best feature. You can now switch between the apps without using just one as every other previous generation of iPhone had. Multitasking, folders, Retina Display integration, unified inbox and threading in Mail, lots of enhancements in camera and photos, deeper enterprise support, and tons of new features everywhere. Google, Yahoo and now Bing adds to the list of search engines, but Google will still be the default one. iBooks application which we talked about in the iPad, is now going to come into iPhone. Everything would be the same, highlighting, controls, and PDF reading. A single book once bought, can be synced and added to every device you have with that single purchase. So you don’t need to buy it again on another device. The iBooks has iBookstore which joins the App store and iTunes store. iAds – The new system that helps the application developers to earn money from their apps, while they have launched their apps free or at a low price. The iAds would let you stay in the app itself and open an ad. Apple would be hosting and selling the ads. Nissan, Citi, Unilever, AT&T, Chanel, GE, Liberty Mutual, State Farm, Geico, Sears, JCPenny, Target, Best Buy, DirecTV, TBS network, and Disney are some of the companies that would be advertising. And around $60m of ads would be displayed in the 2nd half of 2010. That’s around 48% of total mobile ad revenue in U.S.
Video calling through Facetime possible, from iPhone 4 to iPhone 4 where there is WiFi available. There is no setup required for this calling type, and you have 2 options – Portrait mode and landscape mode. You can use any of the cameras, either front or the rear for the video calling. Super audio and video quality. The iPhone 3GS from June 24th, would be available for just $99, and the iPhone 3G sales would be stopped. Pre-order from tomorrow – US, France, Germany, UK, Japan as of now. In july and august, totally 88 countries would be included for shipping.